Yesterday dozens of countries joined the UK in expelling Russian diplomats over the brazen poison attack on Russian ex-spy Sergei Skripal and his daughter Yulia in the provincial English town of Salisbury earlier this month. 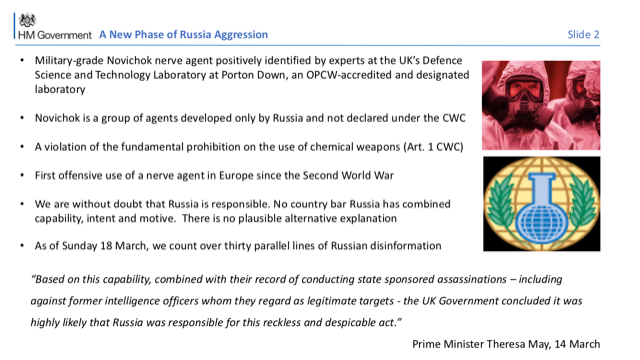 Unfortunately, Russia’s response to the unprecedented coordinated expulsion – the most serious punitive action taken by Western nations against Russia since the Cold War – is more of the same obfuscation, distortion and indignation we saw when we first learned of the shocking assassination attempt using a Russian chemical weapon on British soil. 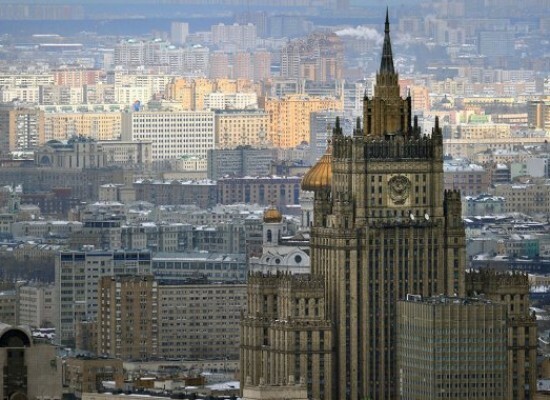 Today Maria Zakharova, spokesperson for Russia’s Foreign Ministry, made a curt and indignant statement referencing several infographic slides published in the Russian news outlet “Kommersant,” expanding on a report of last week’s meeting in Moscow where British diplomats presented their findings on the Salisbury incident to the Russians. 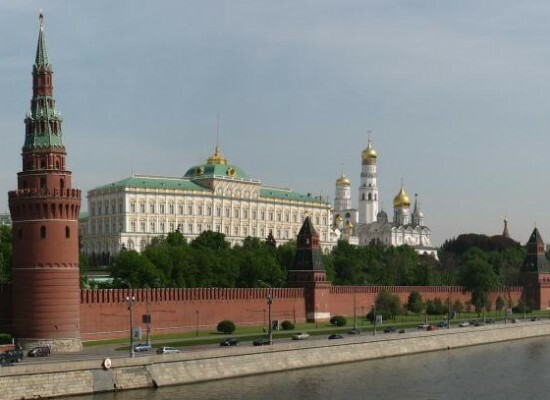 The March 22nd closed briefing in Moscow at the British Embassy came at the request of Moscow, who demanded the Brits explain their allegations against Russia for the Salisbury attack. The briefing followed another meeting the day before, March 21, at the Russian Foreign Ministry, where sparks flew as Russian and British diplomats “launched sharp allegations against each other over the nerve agent attack.” Reuters reported this remarkable meeting was televised on state television. 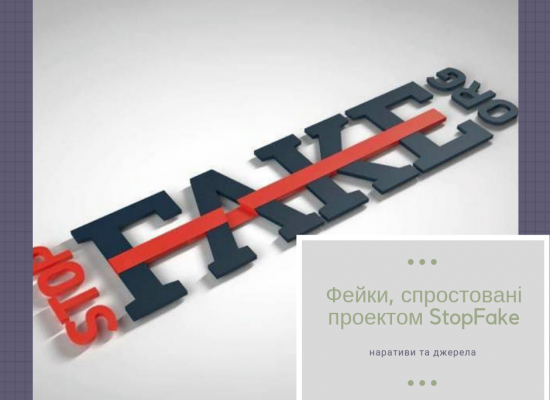 Today Zakharova pounced on the Kommersant report on the materials accompanying the U.K.’s presentation to mock the entire endeavor, echoing now familiar Russian propaganda themes and tactics used by the Kremlin to deflect its responsibility for its aggression around the world. 1. 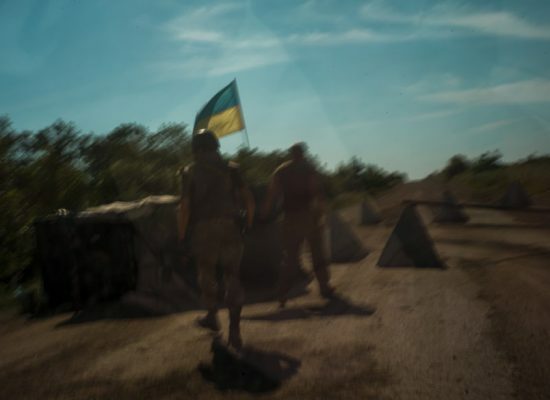 Mere Speculation – No Evidence Russia Is Responsible. Although she doesn’t use the term here, Zakharova implies that the Brits have perpetrated a crime against Russia. As we’ve seen before, she suggests Russia is the victim of a vast conspiracy, that the UK has manipulated public opinion of the leaders of 25 countries to punish Russia, by expelling diplomats, for absolutely no reason. “British authorities have perpetrated the greatest manipulation of world public opinion,” she says. This propaganda “flipping of the narrative” is especially cruel and mind-boggling in this case, given that a man and his daughter lay dying in a hospital, unlikely to ever recover, from a Russian-made chemical weapon attack on what should have been an otherwise pleasant Sunday family outing. 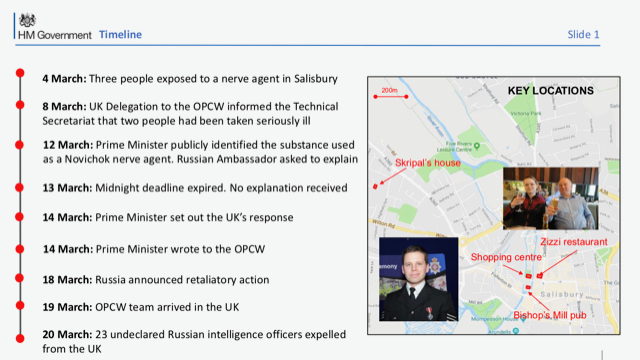 Not to mention, the trauma on the Salisbury community affected by a military-grade nerve agent used in their town. 3. “Secret Slides” – Classified Materials. 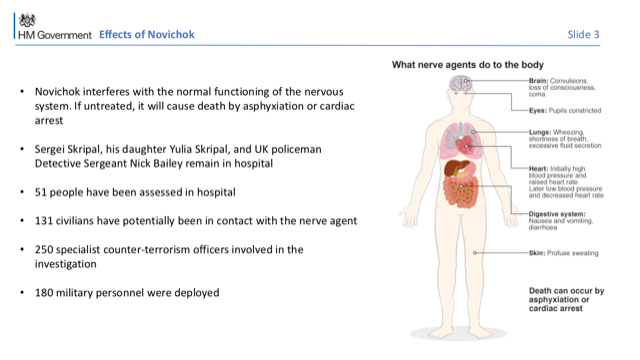 In addition to downplaying the evidence, the gravity of the incident, and the pattern of malign Russian incidents, Zakharova also mischaracterizes the slides as containing “very secret material.” The infographic slides are summaries of the evidence, not the evidence itself, of course. Moreover, the fact that these slides were used in a closed briefing doesn’t necessarily make these materials classified. In fact, the slides don’t actually reveal anything new. All of the statements pointing the finger at Russia have already been made in public commentary by British authorities. As we’ve seen before, the Kremlin uses classified materials and sources to obfuscate, knowing full well those usually cannot be revealed, as doing so endangers more people. Here, Zakharova plays with the mere designation of “secret” to distort publicly available facts, in a n effort to downplay and obfuscate responsibility. 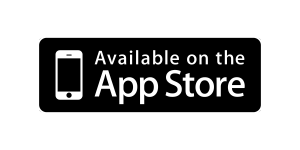 “See for yourself. On the basis of these 6 little slides, they determined that the Russian government is responsible for the chemical attack.” This is pure gaslighting. 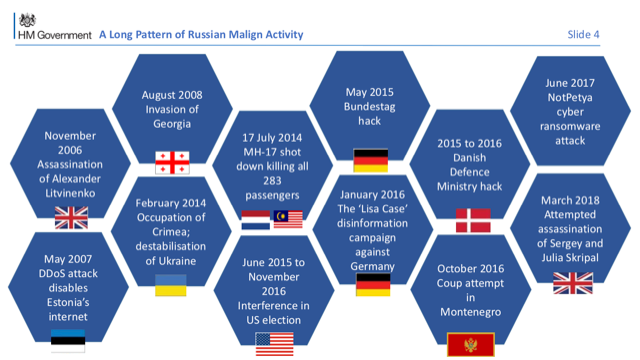 Any reasonable person reviewing even just the incidents in these infographic slides would be fooling themselves not to recognize the long pattern of Russian aggression – cyberattacks, assassinations, disinformation campaigns, military invasions, to name just a few listed in Slide 4. 5. Trolling. 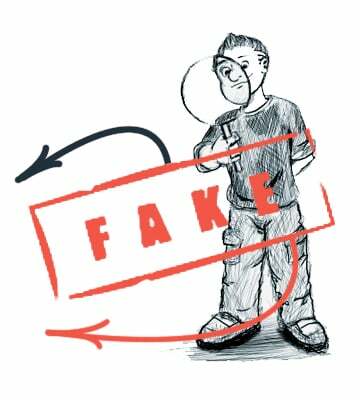 Last but not least in Russia’s propaganda playbook is the characteristic sarcasm, mocking the criticism leveled at the Kremlin’s behavior, coupled with righteous indignation. 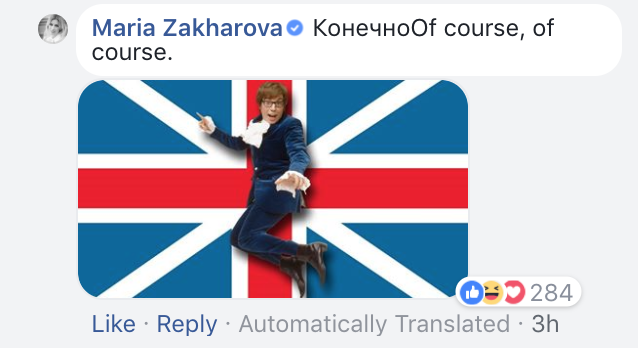 In response to someone’s comment to her post, Zakharova posted a silly picture of “Austin Powers,” the movie character that mocks British spy, a kind of anti James Bond. It’s truly a sad state of affairs when Russia’s Foreign Ministry puts out ridiculous comments such as Zakharova’s day after day, when lives hang in the balance. 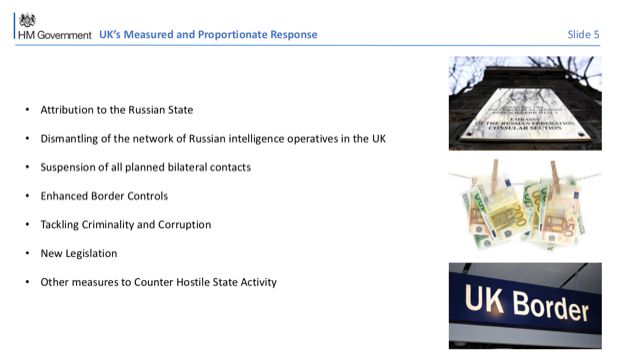 The U.K. spelled out some of the actions it was prepared to take in response to the brazen assassination attempt on British soil in Slide 5 below. Over the past two days, 25 countries, as well as NATO, have announced the expulsion of Russian diplomats. While these are largely symbolic actions, they’re indicative of more serious ones to come. They also show that, despite Putin’s efforts to destabilize our alliances, he has not succeeding in dividing the West. The Kremlin seems unwilling to recognize just how much its own actions are responsible for Russia’s increasing isolation in the world.